Purchase DVDs direct from the source. All orders shipped within 24 business hrs Guaranteed! Purchase a JeffLangeDVD Gift Certificate. Click here for a check-off sheet of all JeffLangeDVD titles, sorted by release order, park specific and series! Click here to shop direct from Amazon.com and help support JeffLangeDVD! What is your favorite WDW park? 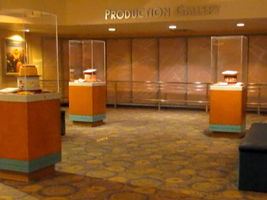 We stopped by Disney’s Hollywood Studios yesterday, and visited the Magic of Disney Animation Building to see if anything had changed. 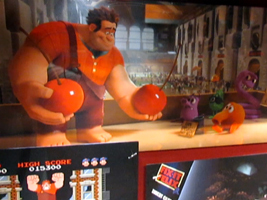 We expected the Brave art exhibit to be there, but instead found Wreck-It Ralph concept art and displays in the Production Gallery (below, left)! Ralph (below, right) spends over 30 years as a villain in a game called Fix-It Felix, but grows weary in playing the bad guy. He leaves the game, and soon ends up in other adventures. Ralph (below, right), offers Pac-Man cherries to Q*Bert characters.